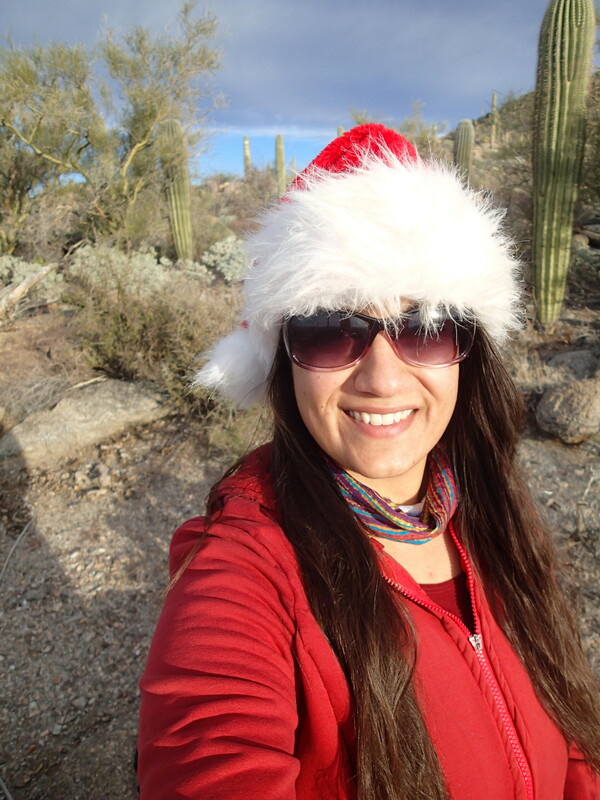 Last year, I spent Christmas in the Grand Canyon. It was awesome. This year, I needed to stay closer to home because my husband is visiting his family and I’m home with our old dog Bailey. 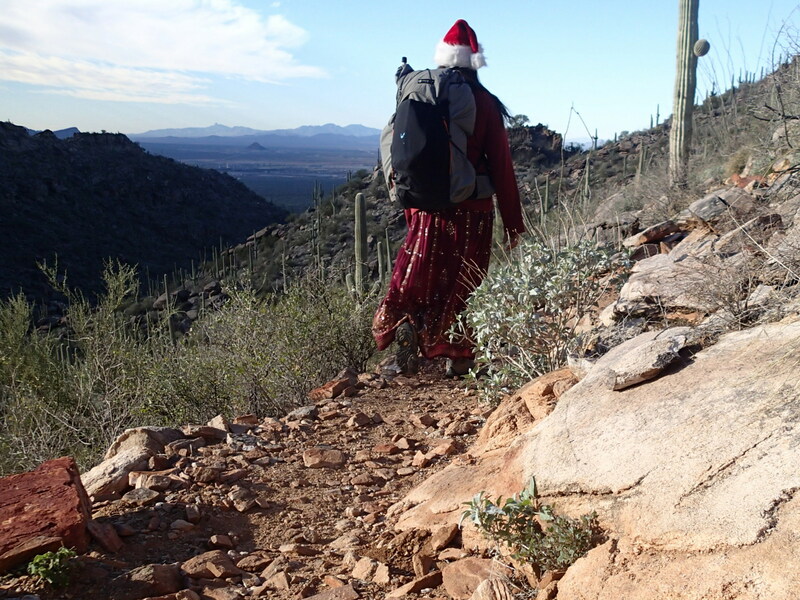 I never hear of anyone backpacking in the Tortolitas north of Tucson, but I thought it might be a fun spot to wake up Christmas morning. I could also choose a campsite that would get early sun. 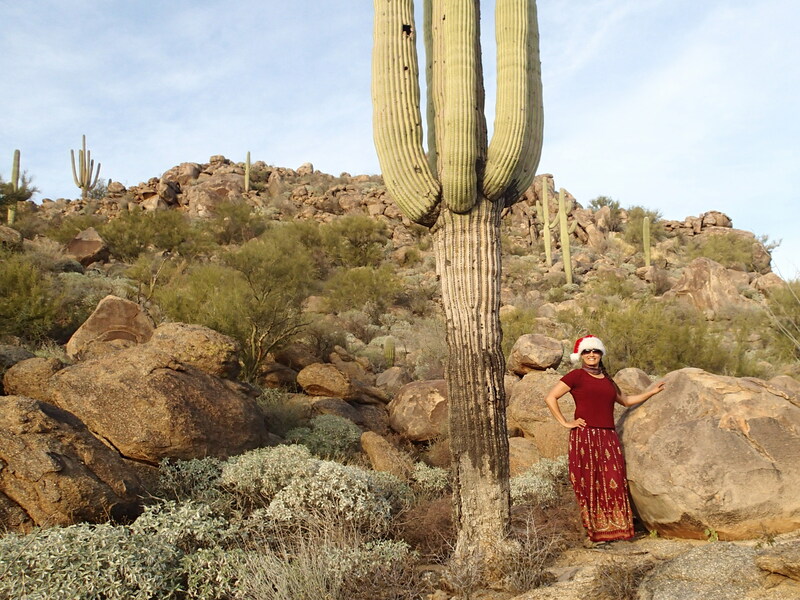 I wanted to make the trip a little special, so I got out a red sparkly skirt my dad had brought me from India and a Santa hat to wear on the trail. 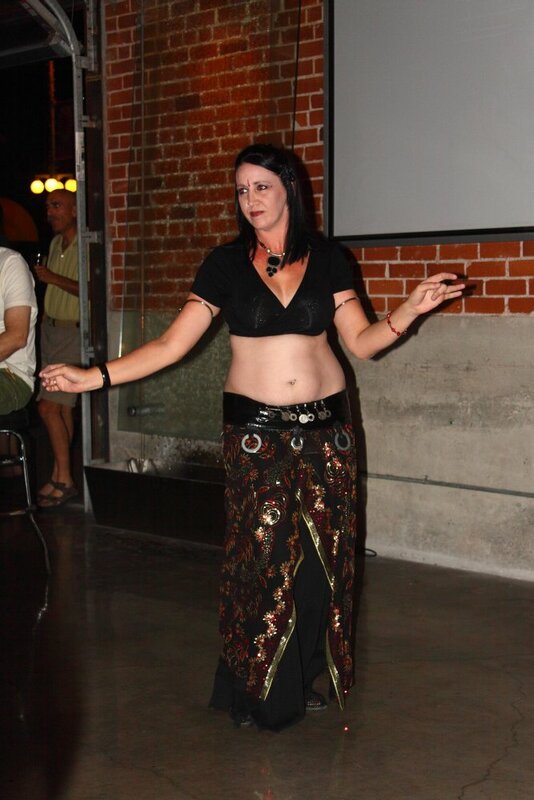 (I can see this becoming an annual tradition- see this picture for last year’s sparkly skirt). I didn’t see anyone after I left the parking lot and once I got past the Ritz-Carlton I couldn’t hear any sounds coming from the hotel. I hiked a little ways past the Cochie Canyon junction and found a great spot right off the trail with wonderful views for the sunset. 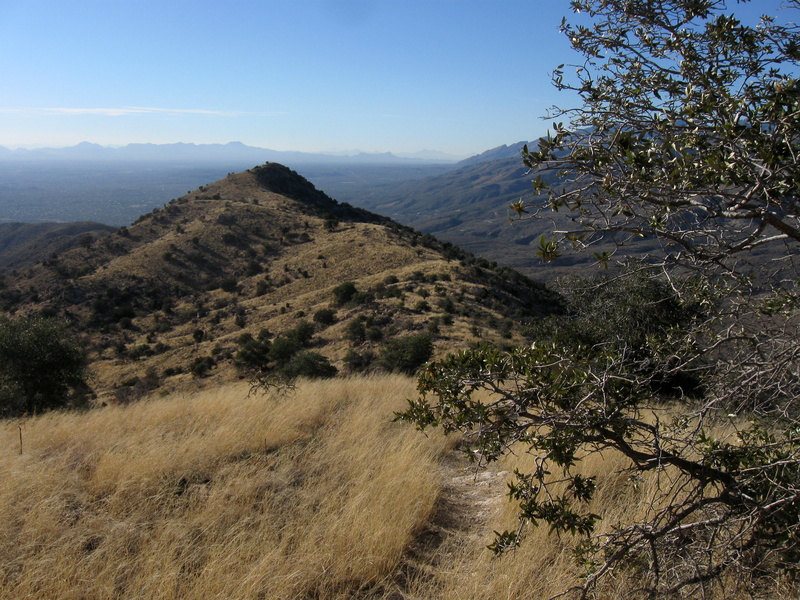 I could see all the way from the top of the Catalinas down to the base of Pusch Ridge, south to the Santa Ritas and Huachucas and Babo, Kitt Peak and Ragged Top to the west. Good stuff so close to town. 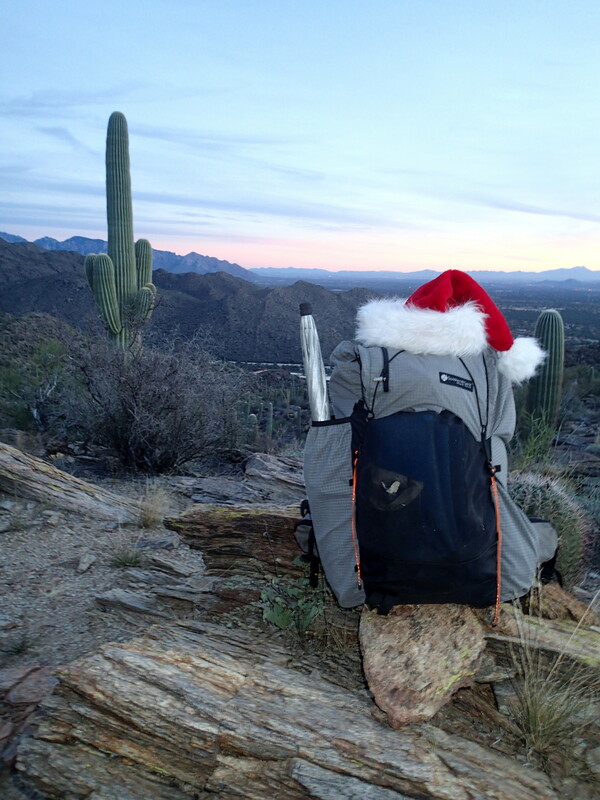 My Gossamer Gear Mariposa and I have been some amazing places this year! Both my family and Brian’s celebrate on Christmas Eve, so I called and people passed the phone around. My family, being Italian, told me all the different foods that were served. My Christmas Eve dinner was cheese fondue with apples, bread, broccoli, cauliflower, and figs for dipping. And for dessert I had blackberries with balsamic and some Panettone (an Italian sweet bread). I listened to some music and then I went to bed. My camp had a great view of the city lights without being too noisy. The morning was gorgeous and the night had been warmer than expected. I wrote a bit in my journal and then got packed up. 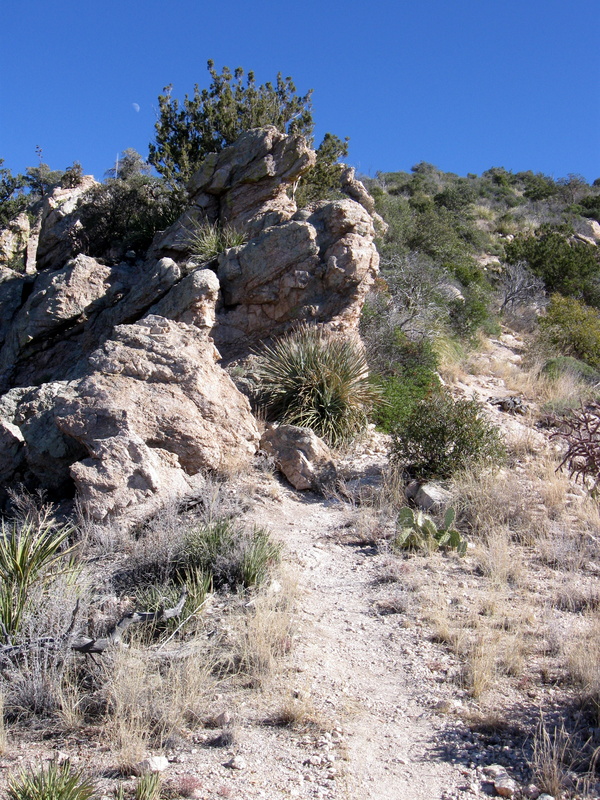 The best part of the hike down was meeting a family from New Jersey that was coming up the Wild Mustang Trail. They asked me how far I’d gone that morning and I told them I’d spent the night out. They didn’t quite know what to make of it- “By yourself? Did you see any wild animals? But you’re so clean! You had the cheapest room in the place!” Pretty funny. I took the hotel spur back to save myself walking the wash and was back at my house by 10:00 am. I had plenty of time to relax and then visit my friend Leigh Anne and her family before going over to Wendy’s for dinner. 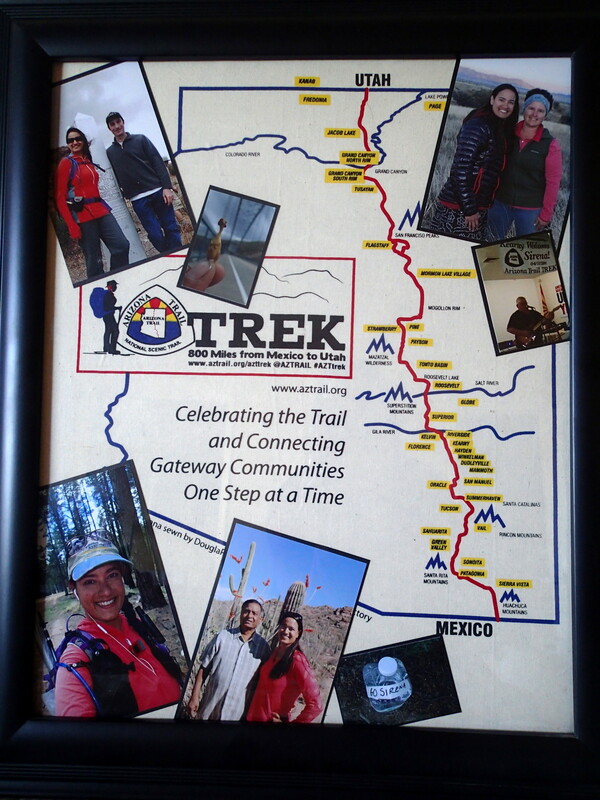 Wendy made me the coolest present for Christmas- she framed one of my Arizona Trail Trek bandannas and put pictures from my hike on it. She’s so thoughtful! 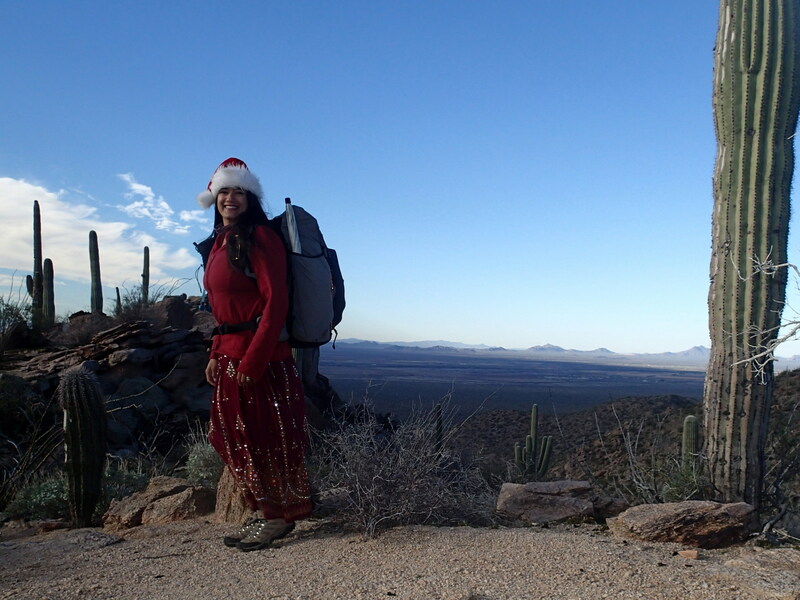 This Christmas was a great mix of indoors and outdoors, solo and with friends. Wendy’s Arizona Trail Trek present- she’s so crafty!! 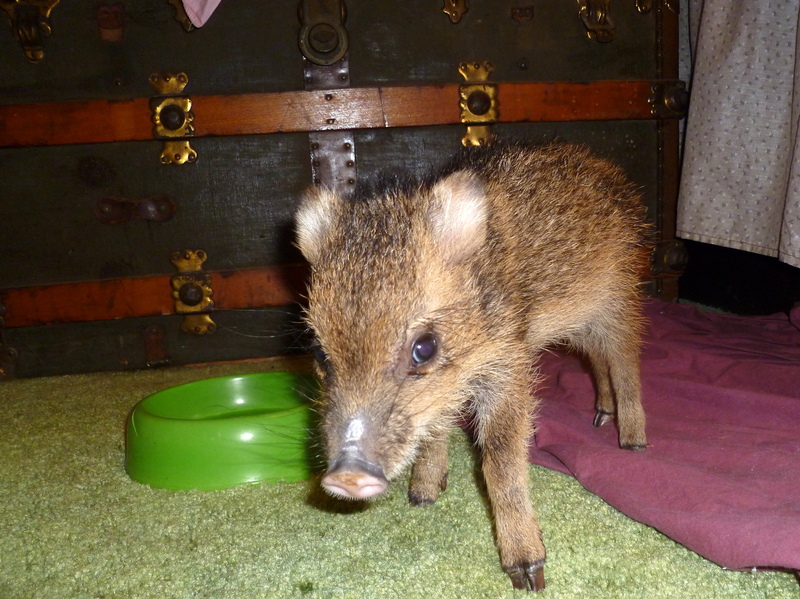 For today’s Wildlife Rehabilitation Northwest Tucson picture, I’m digging into the archives for this little Javelina that came to us several years ago. 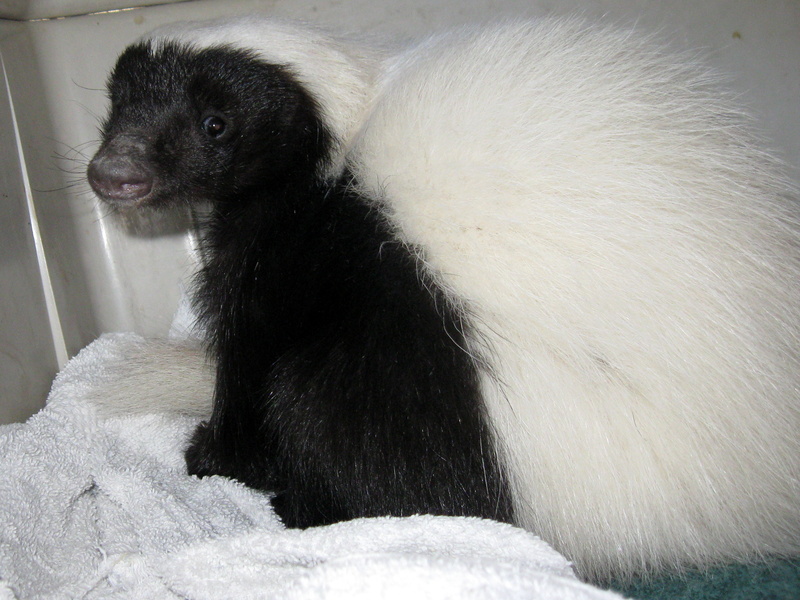 We don’t take care of many larger mammals, so seeing this little guy was pretty fun! 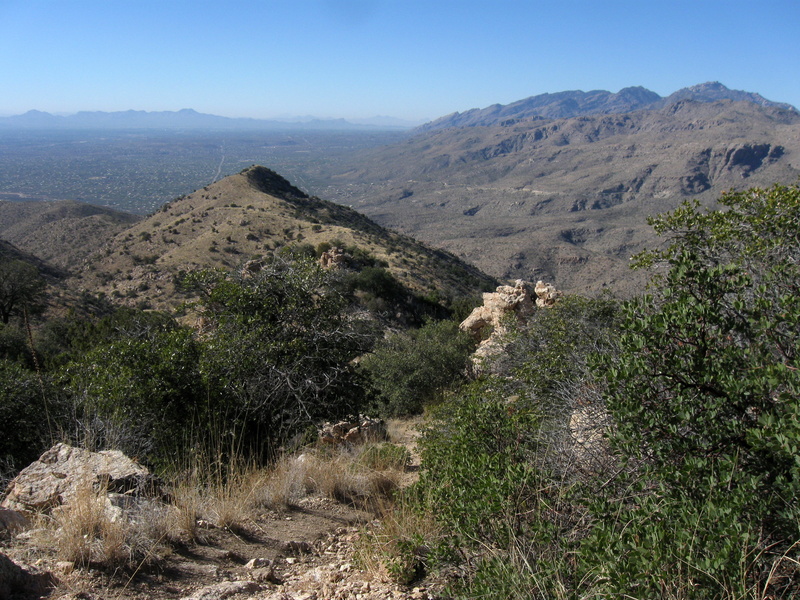 Pusch Ridge is a series of four peaks extending westward in the Catalinas: Pusch Peak, closest to town, The Cleaver, Bighorn Mountain, and the tallest, Table Mountain. 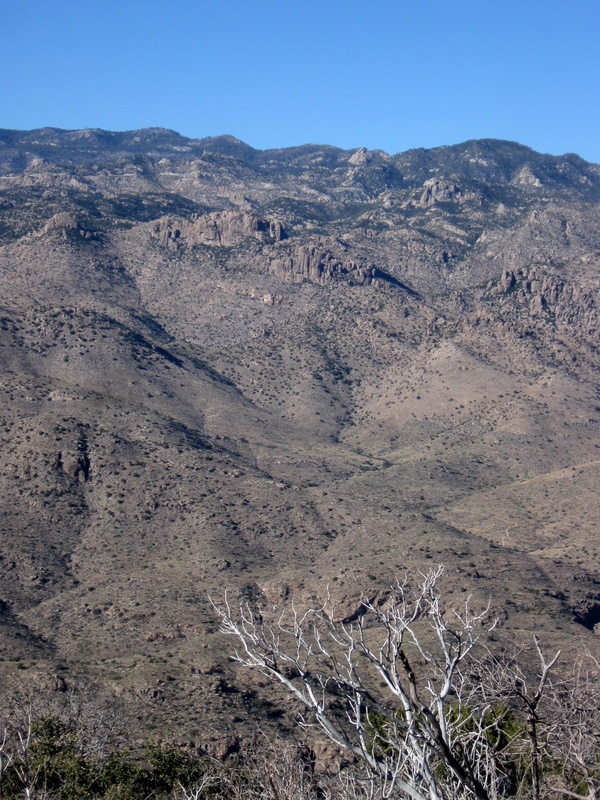 From town, Table Mountain is a dark-green-dotted diamond shape, but from Oro Valley you can see that three sides of the Table are massive sheer cliff walls. I have had a longtime fascination with Table Mountain ever since I came across pictures of the summit views. The thing that most piqued my interest, though, was a photo of the campsite on the summit. Underneath a stately Juniper tree was a beautiful stone fireplace made out of Catalina granite. That was it- there was no way that I was going to hike Table without staying at the campsite on top. There is only a short weather window for this peak because it is off-limits from January 1- April 30th for bighorn sheep off-trail restrictions. Most of the time that it is open, the weather is too hot. Two years ago, I had attempted to backpack to the top for a lunar eclipse, but had a shoe failure and had to turn around. Last year, the weather didn’t cooperate with my schedule. This year everything fell into place and the experience was even more amazing than I had anticipated. 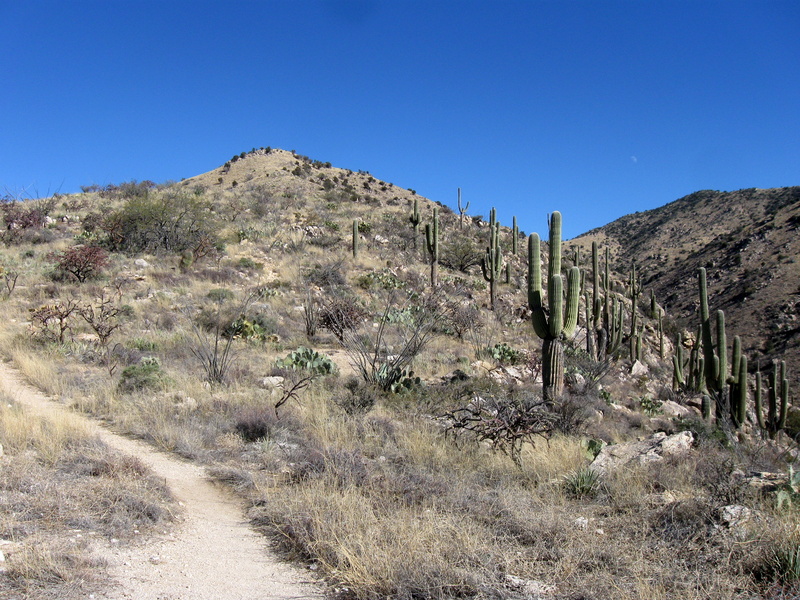 All the trip reports I had read said to take the Pima Canyon Trail three miles to a steep, loose, brushy gully. The reports made it sound unappealing and I was not looking forward to it. I remembered that Cowgill and Glendening’s book mentioned that there was a ridge option that would probably have more shindaggers. 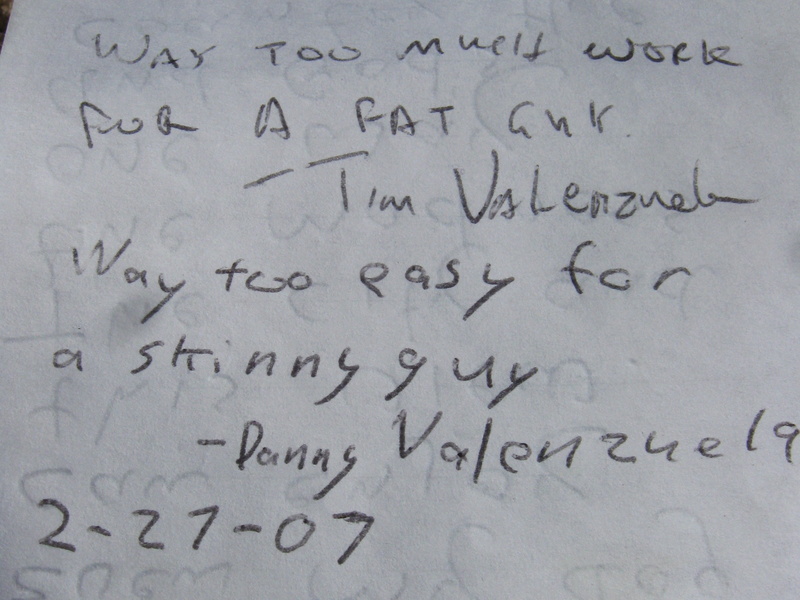 Then I came across a report by a woman who went by the name “Bloated Chipmunk” on NW Hikers.net that had pictures of the route. It looked way better to me, especially with a full pack. 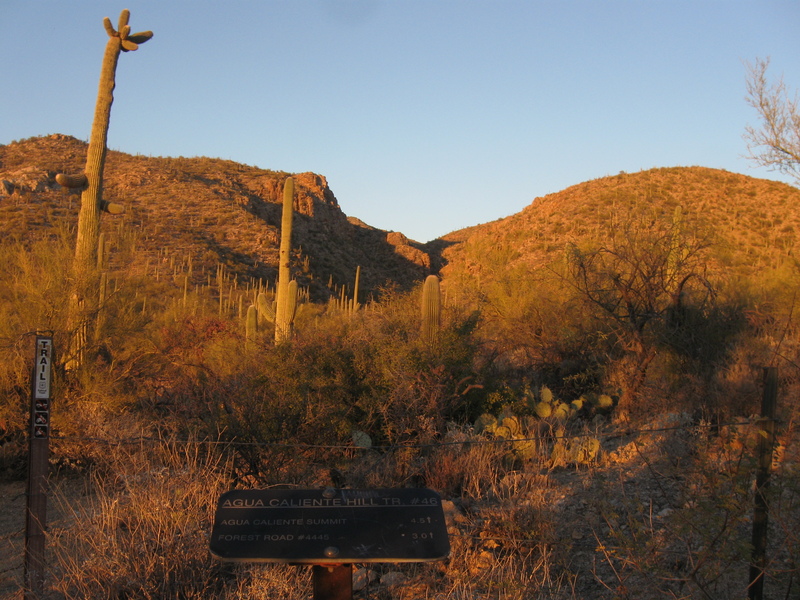 The morning of December 17th, Wendy and I met at the Pima Canyon Trailhead, excited about the adventure ahead. 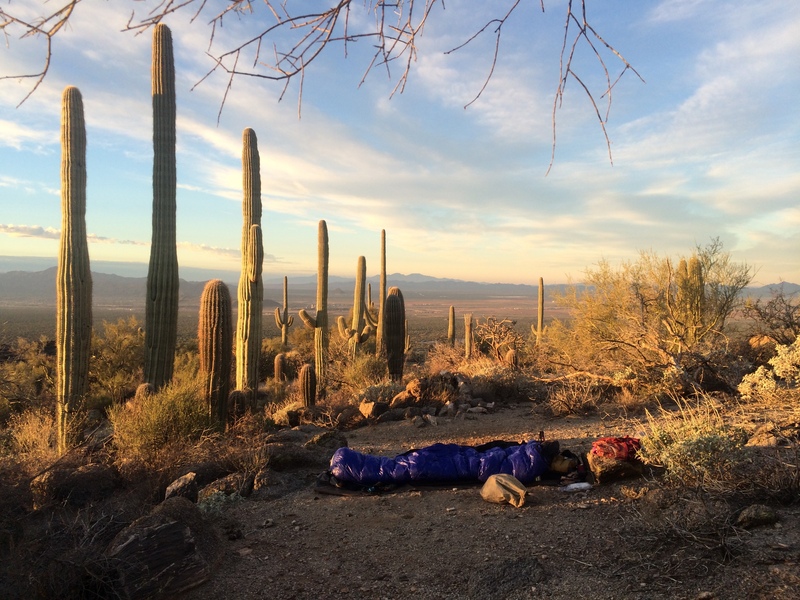 Our packs were heavy with 7 liters of water and warm gear for our night at the 6265′ summit. 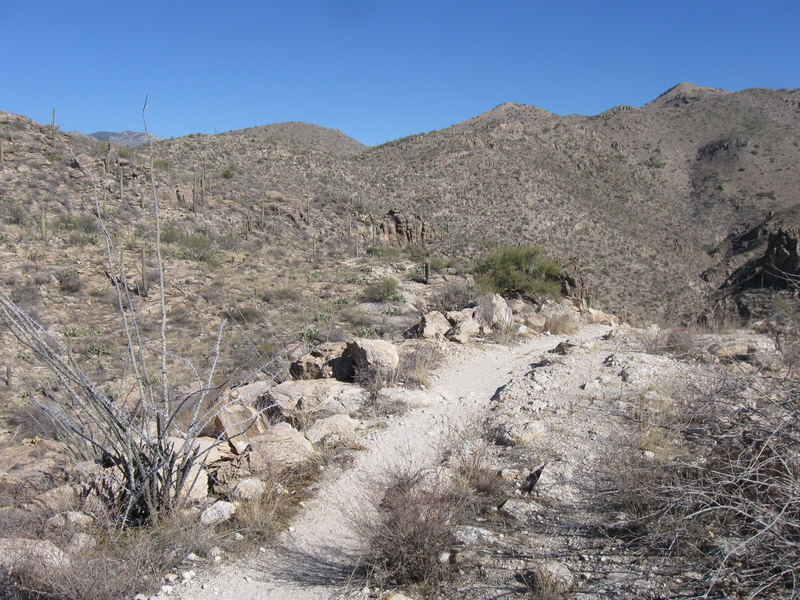 We hiked about two miles on the Pima Canyon Trail and saw the slabs of our ridge route to our left, across the brushy creek. First glimpse of our day’s objective- looks far! We followed the trail until it crossed the drainage. There was a distinct sharp smell of cat urine and a large sprayed area under an overhang. We decided that hit would be better to backtrack and try to cross the creek closer to the slabs. There was a spur trail and a small opening in the brush that allowed us to get into the creek. We took a break before beginning the ascent and I spotted a pair of antlers in the creek. When I went to investigate, I saw an entire deer that had been picked clean, probably by our feline friend. The beginning of the route was on large slanted granite slabs and was quite fun to walk on. 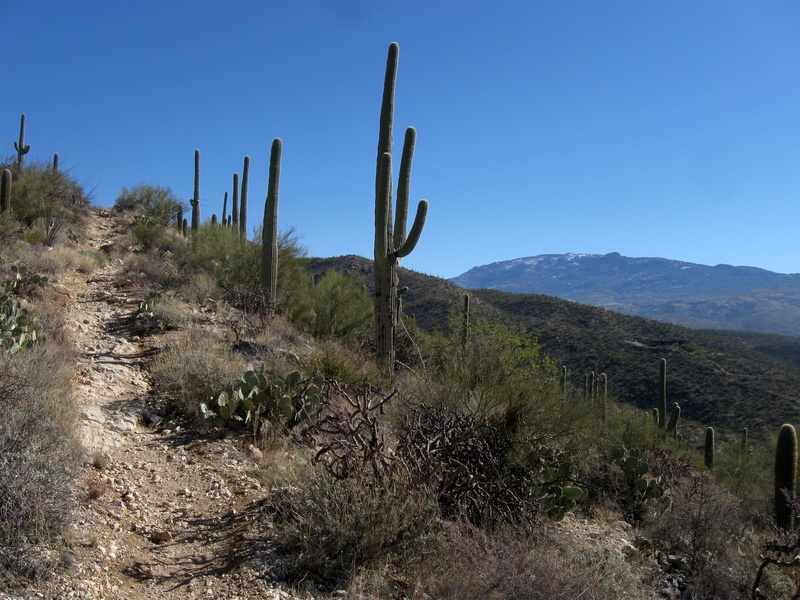 There wasn’t a lot of vegetation and the views were great! The ascent was an off-trail choose your own adventure with the occasional cairn. 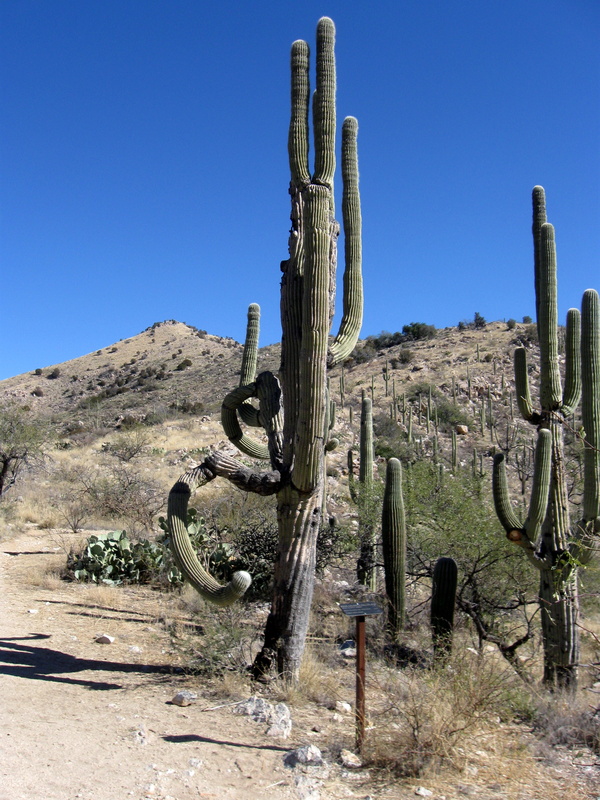 Sadly, the slabs ran out and we picked our way through patches of prickly pear and ocotillo. 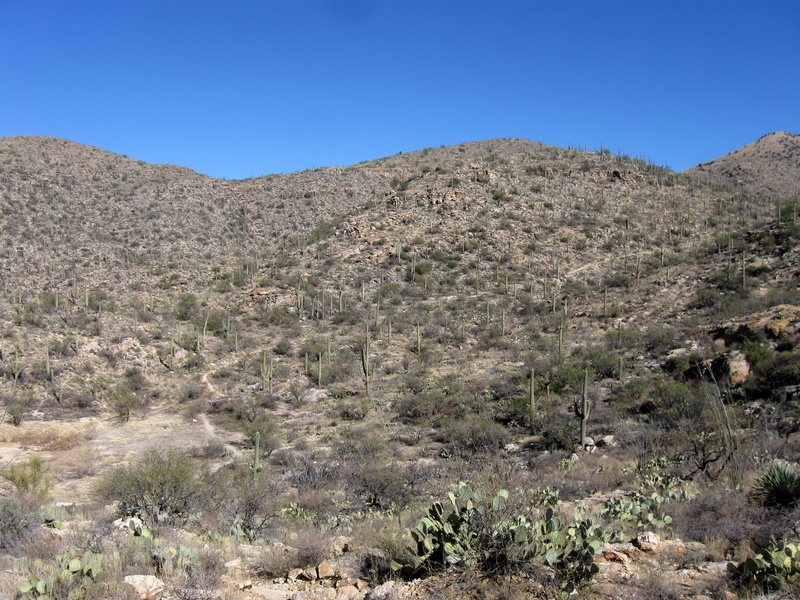 As we gained elevation, we lost most of the cacti and hiked into the sea of shindaggers. Wendy and I wove a path between them when possible, but sometimes there was no choice. 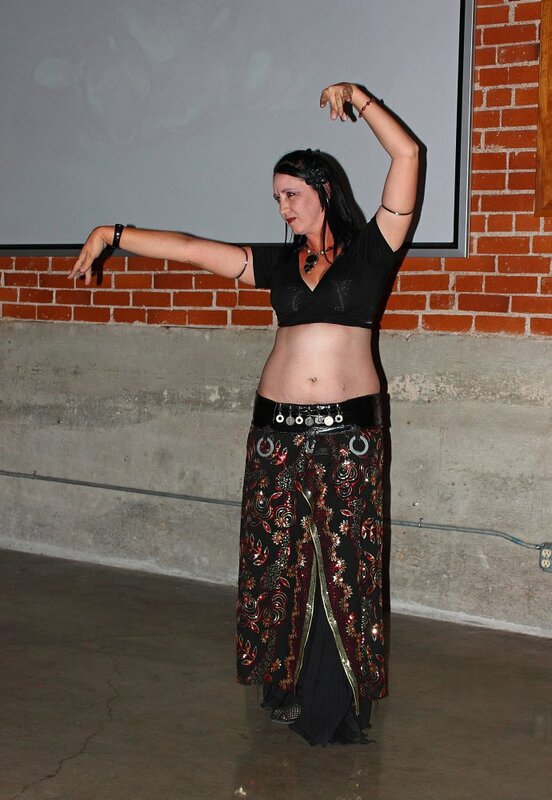 The only way to deal with shindaggers is to step directly on the center. We reached a saddle and took a break for lunch with a fantastic view of our objective. After lunch, we climbed steeply up and toward the Table, aiming above a rocky outcropping with scattered oak trees. The vegetation changed again with our first juniper and pinyon pines appearing near the base of the Table. By this time, Wendy and I were getting pretty tired. We wished that we had a flat table ahead of us, instead there was another 1000 feet of elevation to go. We pressed on, but went a little far to the west and got into some boulders that made travel more difficult. The bonus was that we got to see the great views down the west gully right before the final ascent. 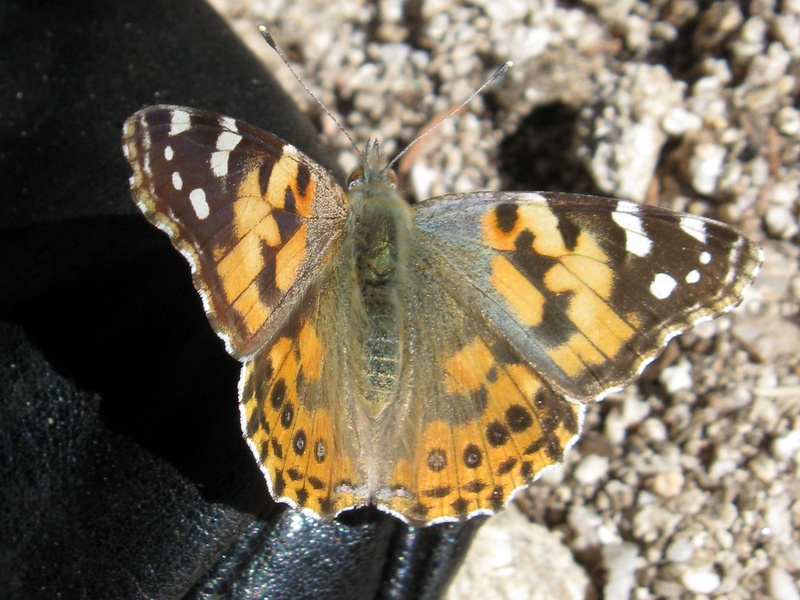 Somewhere along the way we were in a brushy area and I looked down and found a black case with a camera in it. Finally, we could see blue sky and the end of our climb. We went through some pinyon and junipers to a clearing with breathtaking views of the Catalinas and the sheer cliffs of Table Mountain dropping off below. We dropped our packs at the fireplace and toured the summit, dotted with patches of snow. Now came the payoff for lugging all our stuff up here- watching the sunset and sunrise from this incredible promontory and an enjoyable night by the fabled fireplace. 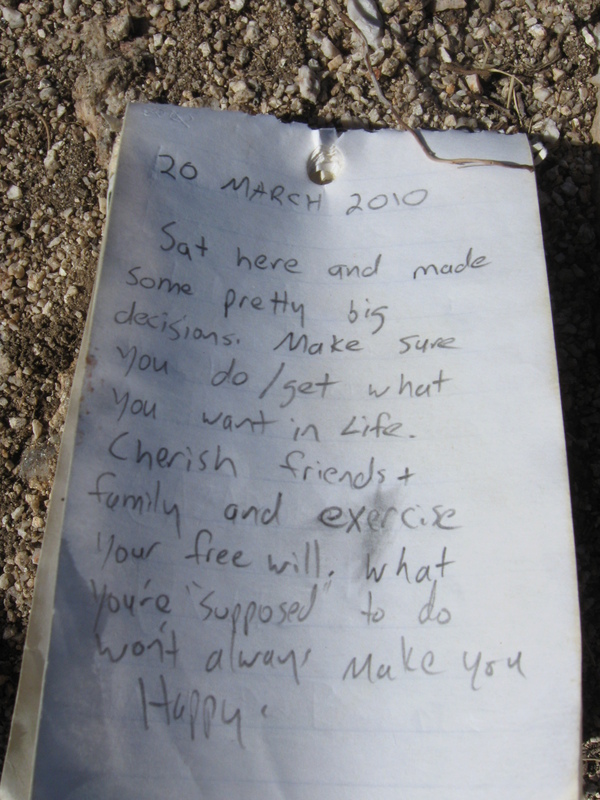 There was a small glass jar summit register near the fireplace and I read through it before dinner. 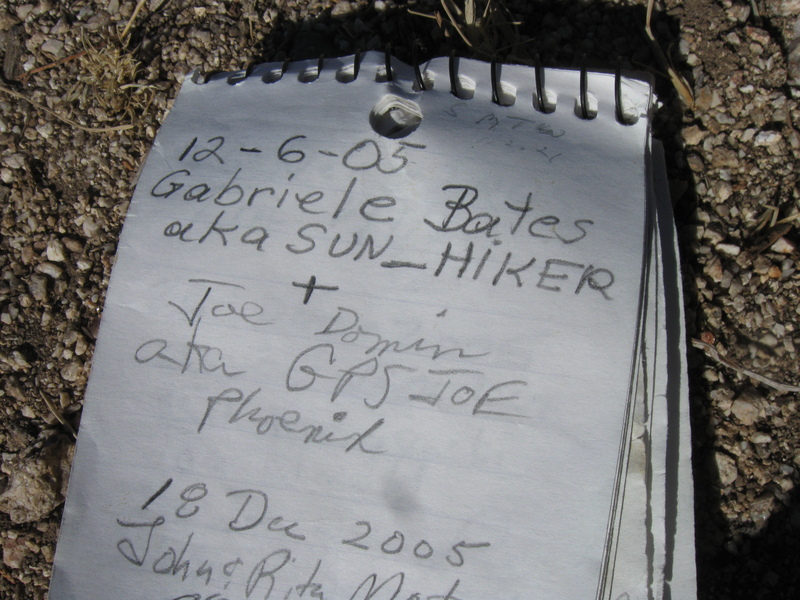 The first name I saw was the woman from NW Hikers.net who’s triplog I’d read. The second entry I read was an entry from February that said “Lost camera in a black camera case” and gave a phone number! 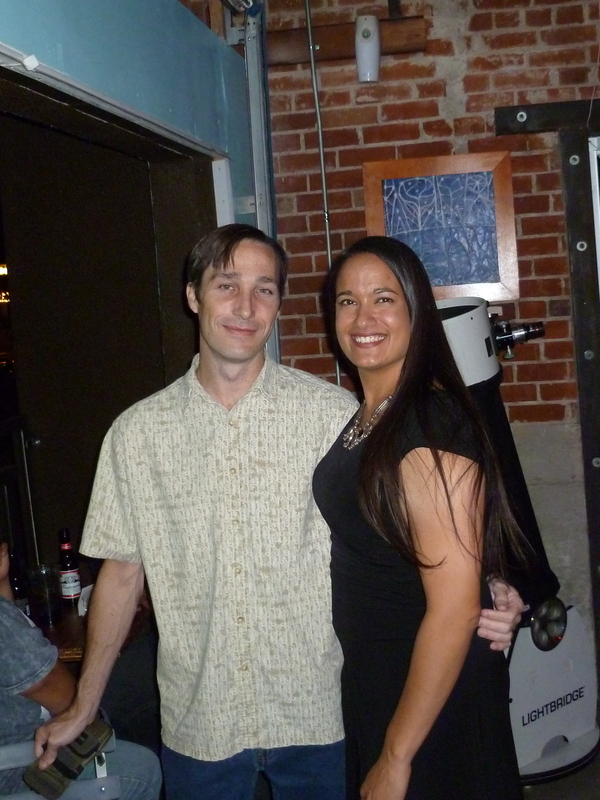 I was so excited that we were going to be able to reunite the camera with its owners. 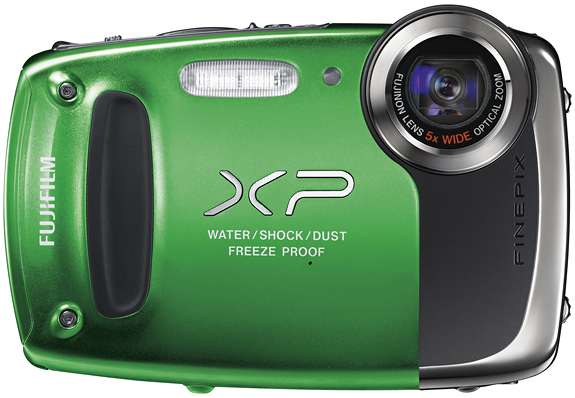 I lost a camera this summer and would give anything to have it back. Wendy got our fire going and we had a decadent meal of cheese fondue with all sorts of items for dipping and chocolates for dessert. 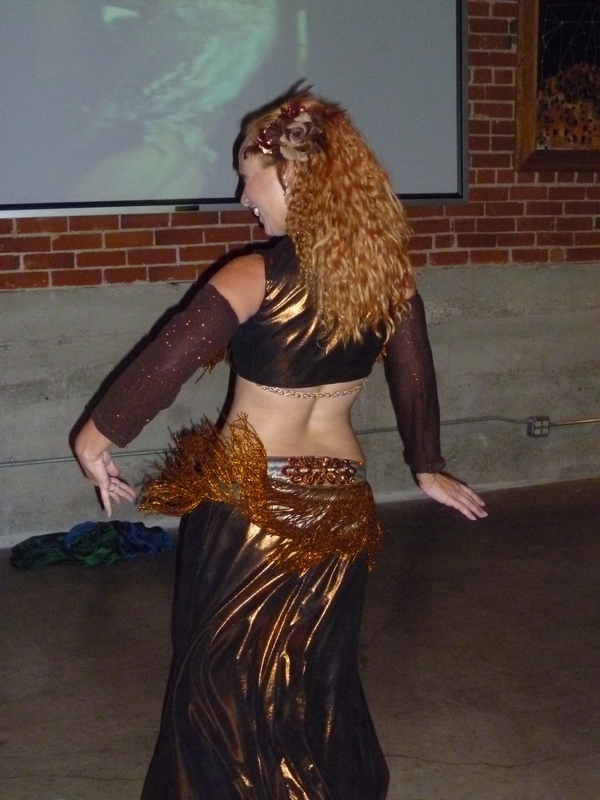 The fireplace was great- it had a chimney and everything which diverted the smoke upward. The fire warmed the rocks and it radiated heat all night long as we slept in front of it. 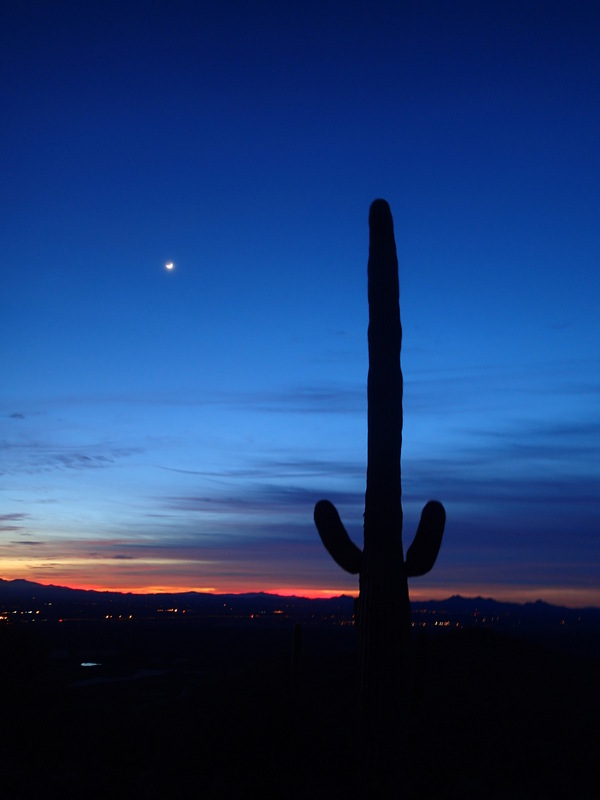 We hit a perfect weather window and the temperature was quite reasonable for 6000′ in December. One of my favorite campsites ever! A little chilly last night! The night was a long one, and it stayed cold for a while after it finally got light out. I spent the amazing sunrise hanging my head over the cliff face and watching the light change. We ate breakfast in our sleeping bags and didn’t want to leave. View north from atop Table Mtn. Eventually, we tore ourselves away and started hiking downhill, packs much lighter after a day’s water and food were consumed. We followed what looked like the standard route down the face which was much easier than our ascent route. But if we’d taken this ascent route we wouldn’t have found the camera. It was a beautiful, cool day and we shindagger-stomped our way down the ridge, taking short breaks and thoroughly enjoying ourselves. It felt like we were flying compared to yesterday’s ponderous ascent. The golden cottonwoods in the canyon got closer and closer and then we were back to our slabs down to the creekbed. Our deer departed friend had been moved in the night and looked more macabre than ever. 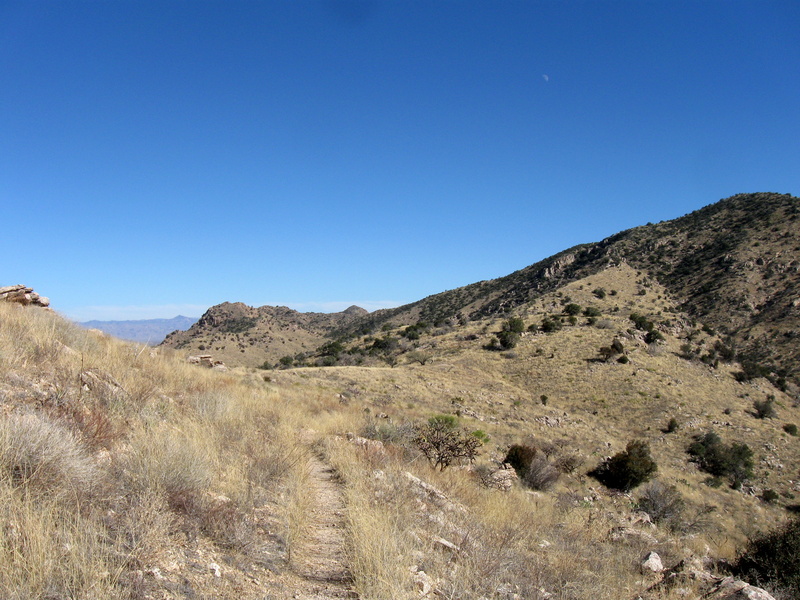 We found our way out of the creek and intersected the Pima Canyon Trail. Clouds started rolling in and the wind picked up. The last two miles back to the car on the trail felt like they would never end. It felt great to look up at Table Mountain knowing we’d finally spent the night at the fireplace. We had been talking for the last two days about what flavors of gelato we were going to get at Frost after our hike. The weather changed so quickly that by the time we got our gelato, we had to eat it in Wendy’s car with the heat on! 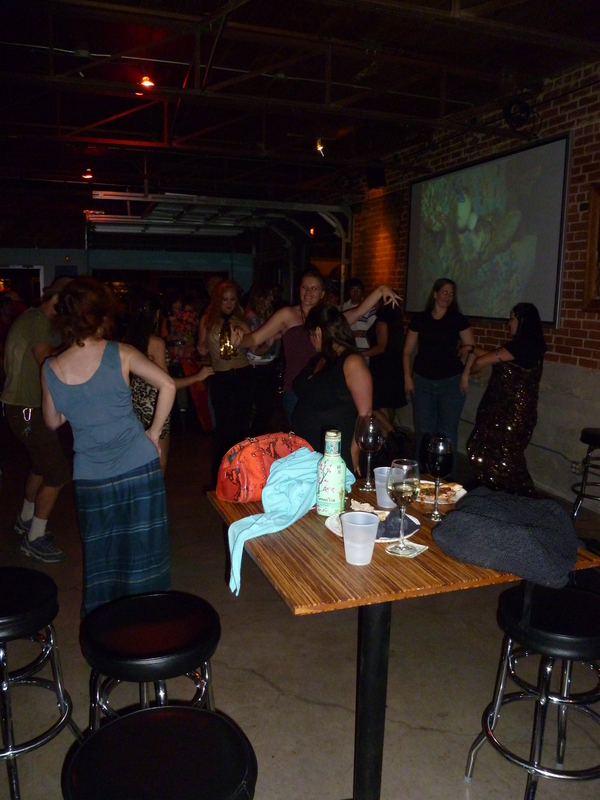 That night, I called the owners of the camera and they were so excited that we had found it! They had gone back up the next week to try and locate it to no avail. It had become a running joke between their friends that someone was going to finally find the camera that was lost on Table Mountain. I dropped it off the next day on their porch and they sent a lovely card thanking us for returning their long-lost camera along with some pictures from the day they lost it. What an amazing, life-affirming couple of days on the mountain. 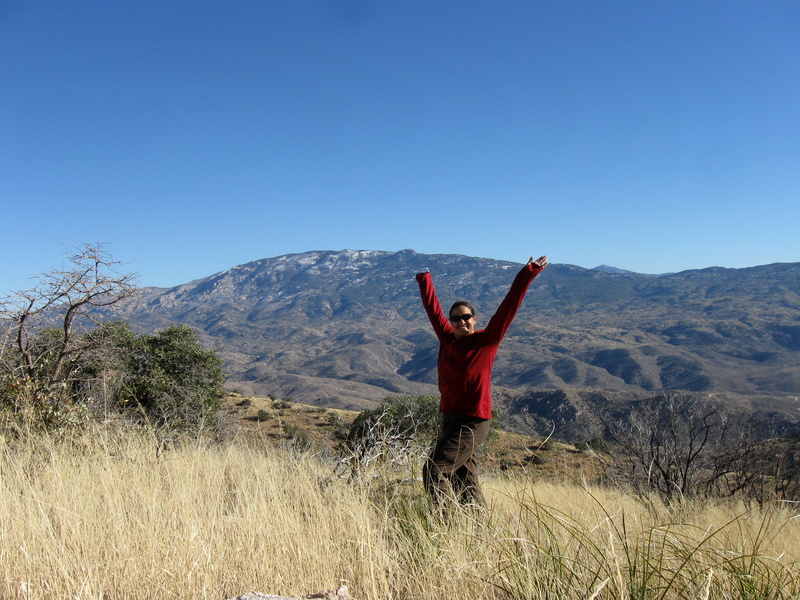 I’ve found another of my favorite campsites and Wendy is always a blast to hike with. So glad I finally got to spend a night on Table Mountain and it certainly won’t be my last. 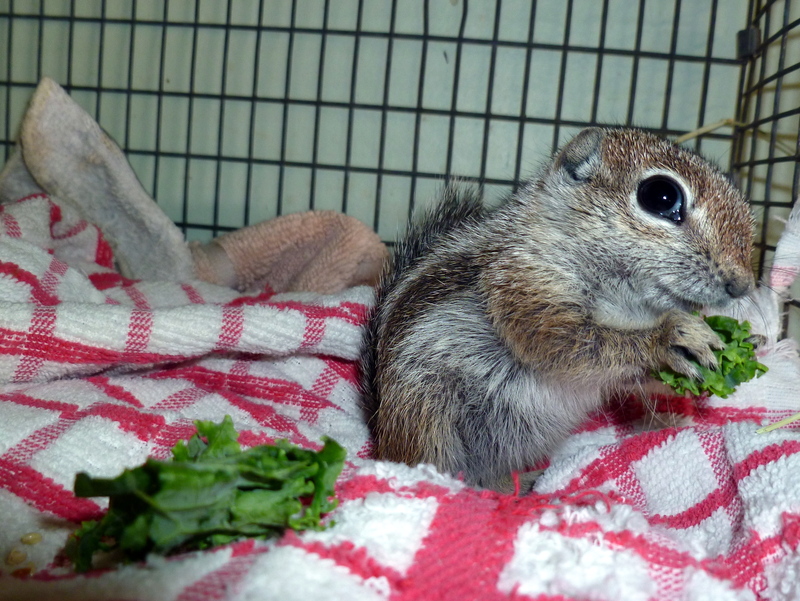 In Wildlife Rehabilitation news, I was going through old pictures when I came across this shot of mama and baby bunnies from 2010. So cute! You can read their story here. 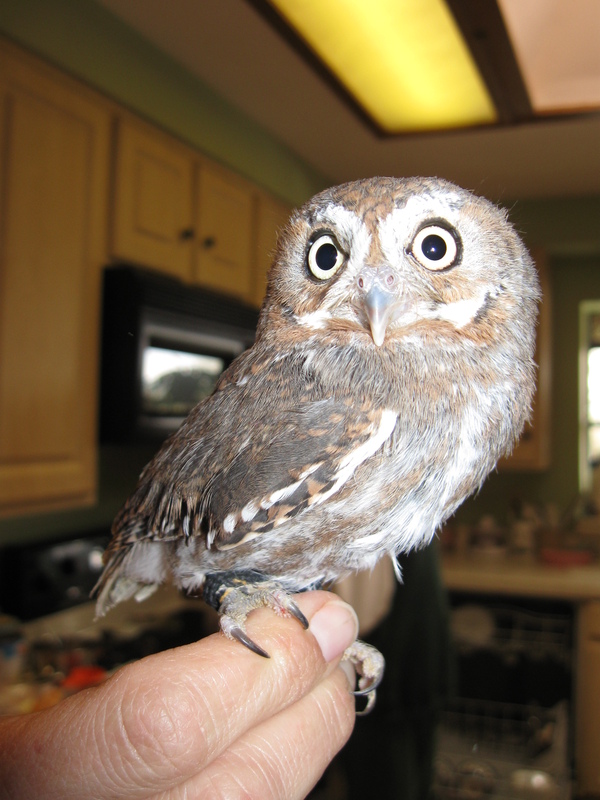 Click below to donate to Wildlife Rehabilitation Northwest Tucson. 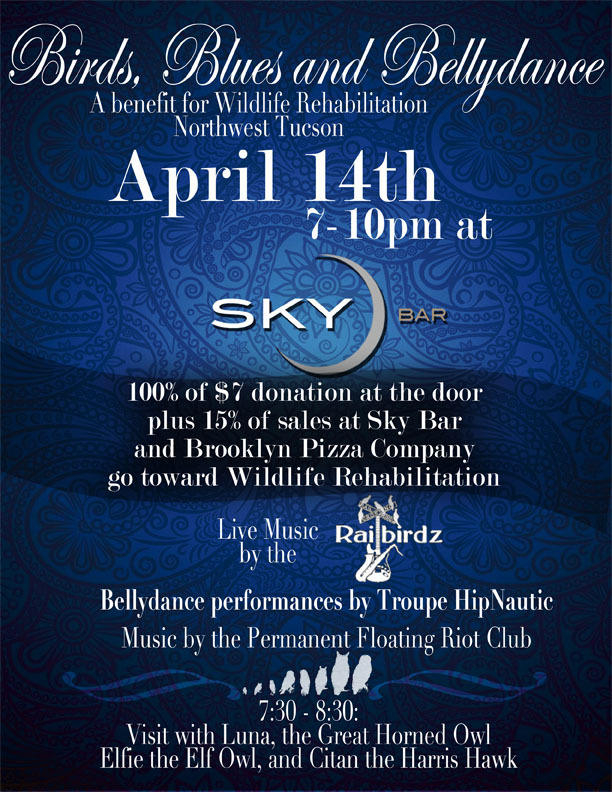 It’s that time of year again- time to head out to Sky Bar at 536 N. 4th Avenue from 7-10 pm Saturday, April 14th for the second annual Birds, Blues and Bellydance Benefit for Wildlife Rehabilitation Northwest Tucson! 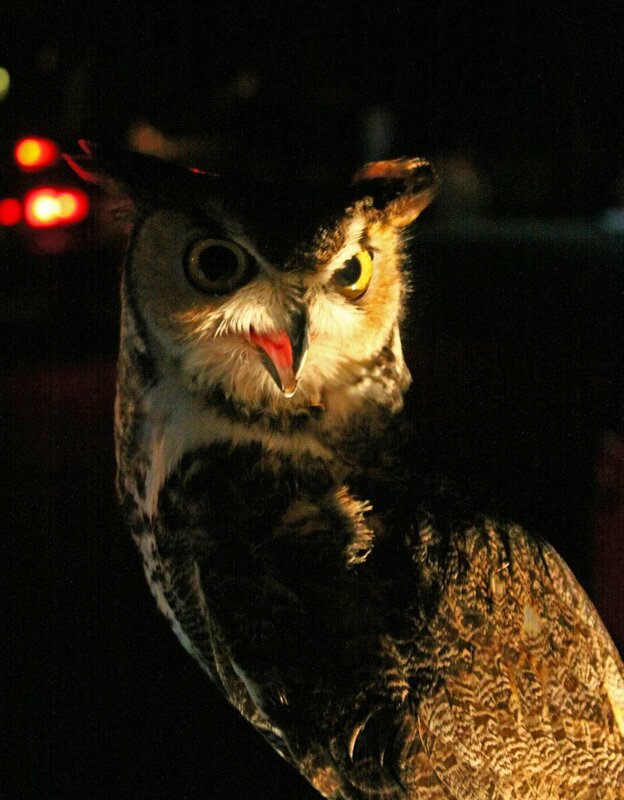 See Luna the Great Horned Owl, Citan the Harris Hawk, and the ever-adorable Elfie the Elf Owl from 7:30-8:30 pm. 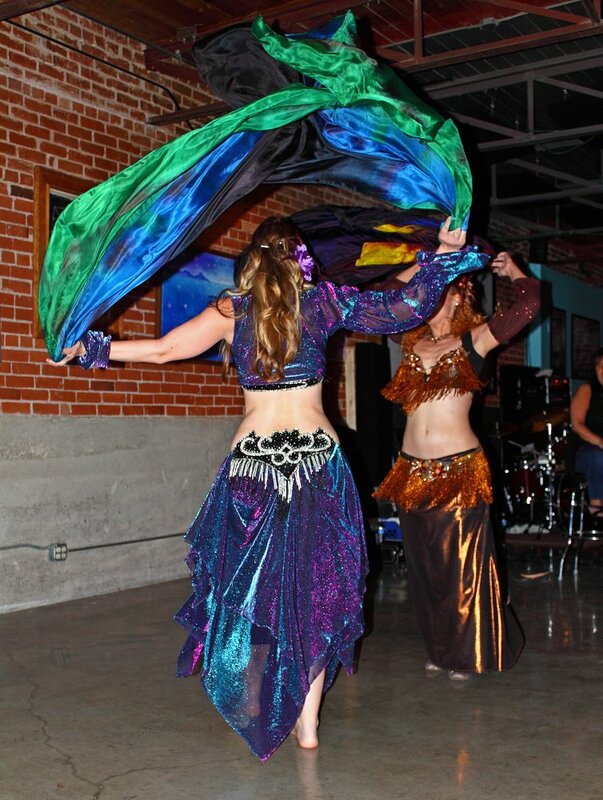 Enjoy danceable, funky blues by The Railbirdz and smoking-hot bellydance performances by Troupe HipNautic and their backing band, The Permanent Floating Riot Club. 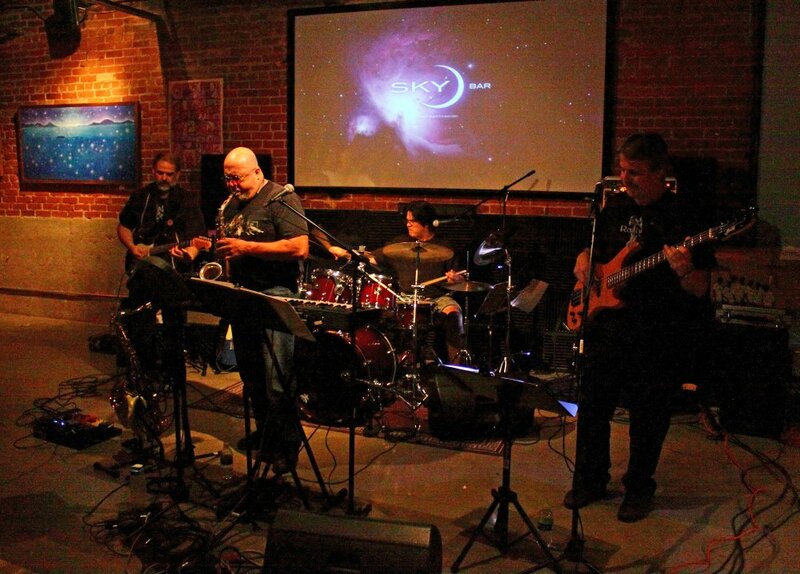 100% of the $7 donation at the door, plus 15% of sales at Sky Bar and Brooklyn Pizza Company go toward the rehab. 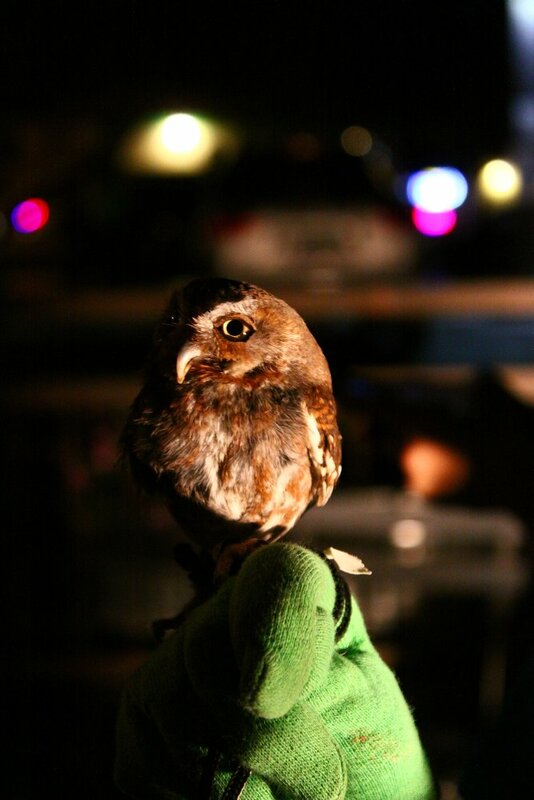 We had a blast last year and raised $1010 for this entirely self-supported rehabilitation center that treats and releases hundreds of birds and small mammals. I’d love if we could double it this year! I feel lucky to count myself among the dozens of dedicated volunteers that help 80-year old Janet Miller run the facility. Janet has encyclopedic knowledge and unending patience and spends thousands of dollars from her own pocket to run the only rehabilitation center on this side of town. So come on out and have a pizza and a beer and support this wonderful cause! 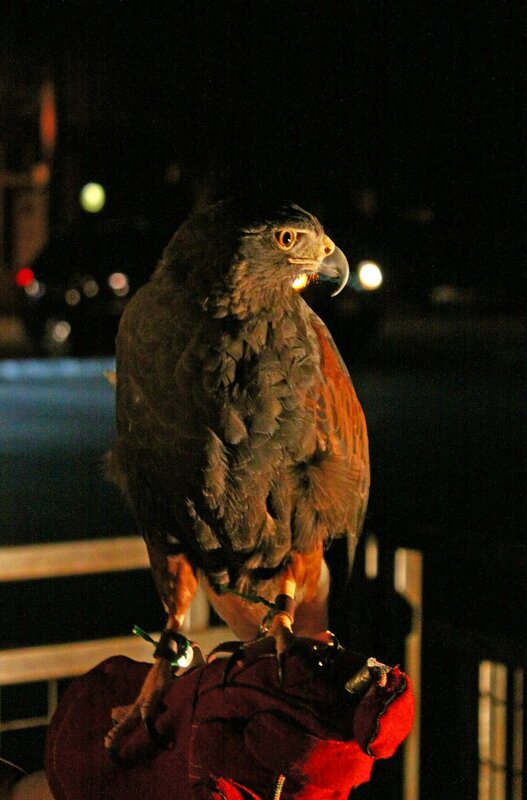 If you can’t make the event, but would still like to donate, click the button below to donate securely via PayPal or send an old-fashioned check made out to Wildlife Rehabilitation Northwest Tucson to Pima Federal Credit Union P.O. 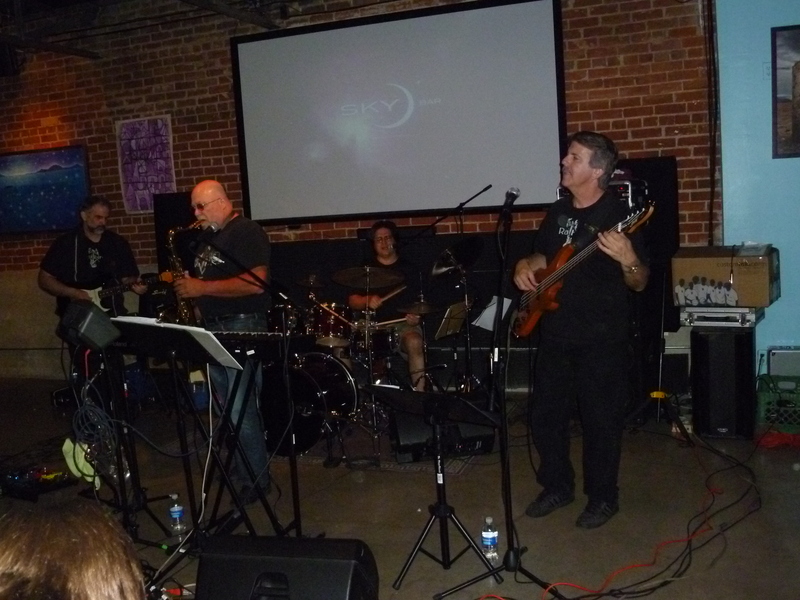 Box 50267 Tucson, Arizona 85703. I’ve been on some pretty fantastic adventures lately, look for a blog post about my return to Baboquivari Peak in the near future. Hope to see you on Saturday!! 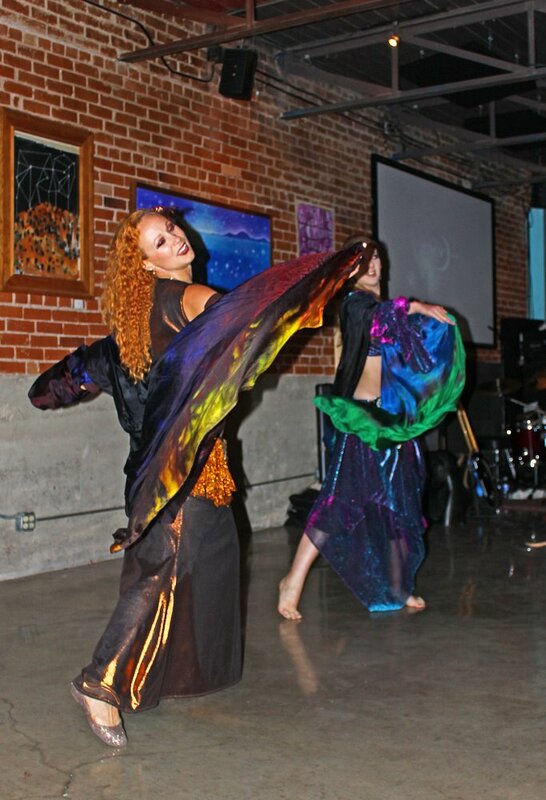 The Birds, Blues, and Bellydance benefit for Wildlife Rehabilitation Northwest Tucson last Saturday, May 7th was a huge success! 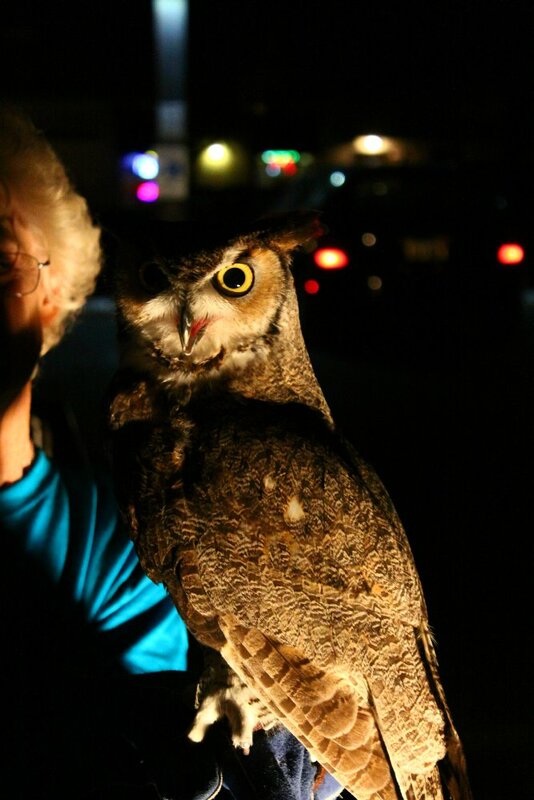 We raised $1010.00 that will go for food, medical care, housing, and maintenance for the many birds and small mammals at the wildlife rehab. 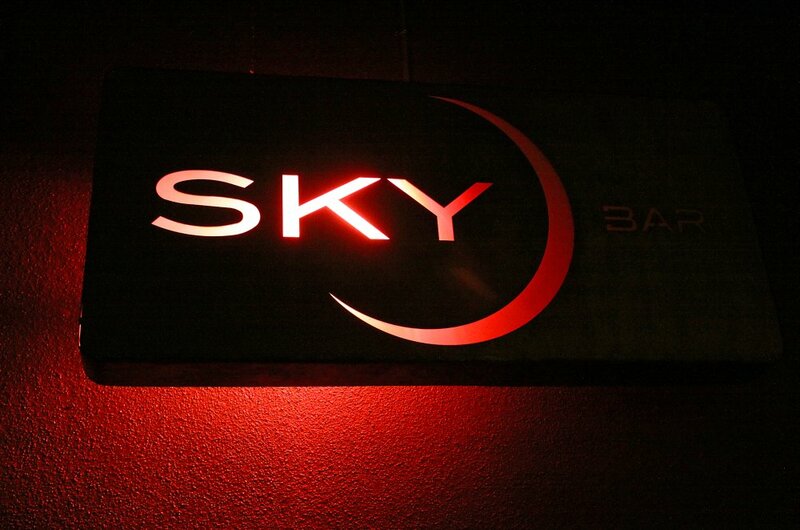 $740 was from the door and $270 from 15% of food and drink sales during the event from the very generous Sky Bar and Brooklyn Pizza Company. 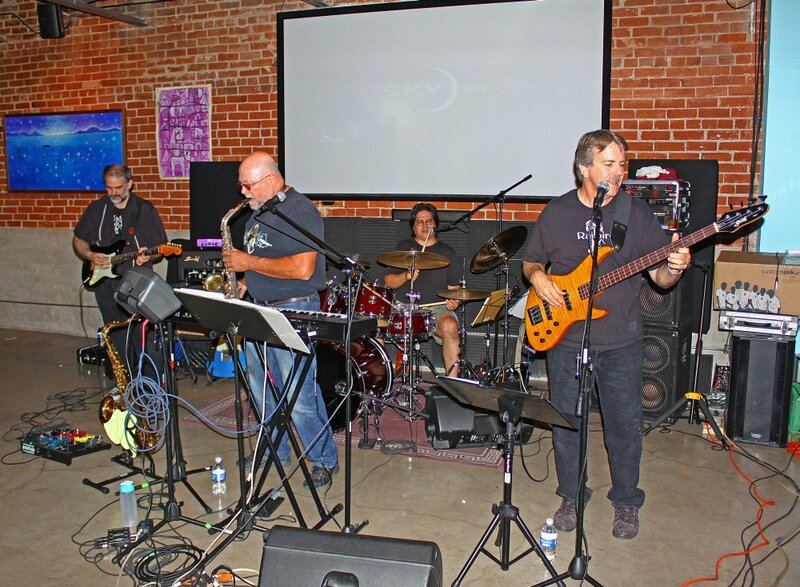 Wine, pizza, blues, and dancing!